While in camp the Senior Patrol Leader or the person he designates is in charge of the Scouts. The Trip Captain and other adults are there to observe, supervise and ensure that the camp is safe at all times. Purchases and cooks the food for the Adult leaders going on the activity. Keeps possession of the Scout medical forms. Ensures that there are adequate Youth and Adult leaders to supervise event. Ensure that the buddy system is followed at all times. The conditions at the event are safe at all times. Make sure that role calls are taken and all Scouts are accounted for. Troop 2 Policy Handbook A trip captain should be familiar with the Camping Policy section of the Troop 2 Policy Handbook. Camp Set Up Checklist Lists tasks that the Senior Patrol, Patrol Leaders and Trip Captain should perform after arriving at camp. Youth Driver Permission Slip A youth driver (under the age of 18) must bring this completed form to a troop activity before they or any passengers are allowed to drive to the event. Summer Camp Packing List Summer Camp packing list. How Parents Can Help With Summer Camp Tips on how to make summer camp run smoothly. Work with the Troop librarian to build and maintain a troop library of merit badge books/pamphlets and other advancement literature. Propose & schedule several annual Troop sponsored merit badge activities (especially for Eagle required merit Badges) as part of the Troop calendar and support the logistics for these. Support District Advancement Day sign-ups and logistics for these. Report out on Merit Badge statistics for the Troop. Merit Badge Counselor Guide - BSA materials on becoming a Merit Badge Counselor. In absence of a Merit Badge Coordinator the duties of this role are the responsibility of the Advancement Coordinator. Since the Advancement Coordinator still bears the ultimate responsibility for these duties they will provide oversight/guidance for the Merit Badge Coordinator. This position is only active once a year. Although there are many details in preparing a successful fundraiser, the coordinator is only responsible for making sure that all of the tasks have been assigned and are being performed. The first task begins 7 weeks before Easter. Delegates items listed in the Flower Sale Spreadsheet. Monitors status of each item. Schedules and chairs necessary meetings to discuss responsibilities. Call Eagle Scout after they have passed the Eagle board and explains the responsibilities of the family and the troop. Click here to see who does what. Maintain a list of civic, religious and business leaders, including names and current mailing addresses. Since many of the people on the list are elected officials, this list should be reviewed every two years. Click here to view the list. Send a request for a commendation letter to each person on the list of leaders. The Scoutmaster must sign each letter. Click here to view the letter. The letter should include an abstract of the scout’s career and project and should invite the addressee to send a commendation to Troop 2. The abstract should be written by the Eagle Scouts family and the Scoutmaster. Click here view a sample abstract. Make up a binder with all of the commendations received from the leaders. Bring this binder to the boy’s Eagle Court of Honor. When the boy’s Eagle packet is available at council headquarters, enroll the boy for 5 years in NESA. The NESA application is in the boy’s Eagle packet. Bring the NESA membership card to the Court of Honor. Before a boy’s Eagle Court of Honor, buy the Troop 2 Committee Eagle gift, and the Eagle neckerchief and slide. Keep the props that are often used at an Eagle Court of Honor. Props include candles and placards. Make these props available to the boy’s family to use at his Court of Honor. Be prepared to give a mailing list of past and current Troop 2 members to the family. Be prepared to advise the family on how an Eagle Court of Honor is done, including invitations, programs, decorations, and ceremony scripts. Purchase a congratulations cake and bring it to the Court of Honor. The boy’s family is responsible for putting on his Court of Honor, including invitations, scheduling a meeting room, decorating, arranging for speakers, etc. Families normally use the props kept by the Troop, but not always. The family will normally ask the Scoutmaster to officiate, but not always. 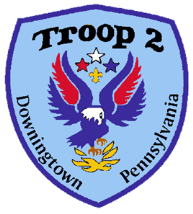 Manages the distribution, collection and ordering of Class B Tee Shirts for Troop 2.